Eric Sanderson wants to turn much of Brooklyn into farmland. Luckily for him, the over 200 guests at his recent Secret Science Club talk in the borough’s Gowanus section didn’t seem to mind. In his New York Times bestseller Mannahatta, published in 2009, Sanderson painstakingly maps the ecology and topography of Manhattan at Henry Hudson’s 1609 arrival onto the modern Manhattan grid. He also discusses his ideas for Manhattan in 2409. Sanderson’s focus now is to reconstruct the natural histories of New York’s other boroughs, and to expand his vision of the entire city’s future. He suggested that if all New Yorkers lived at the density of Manhattan, the city would cover 36 percent of its current area. 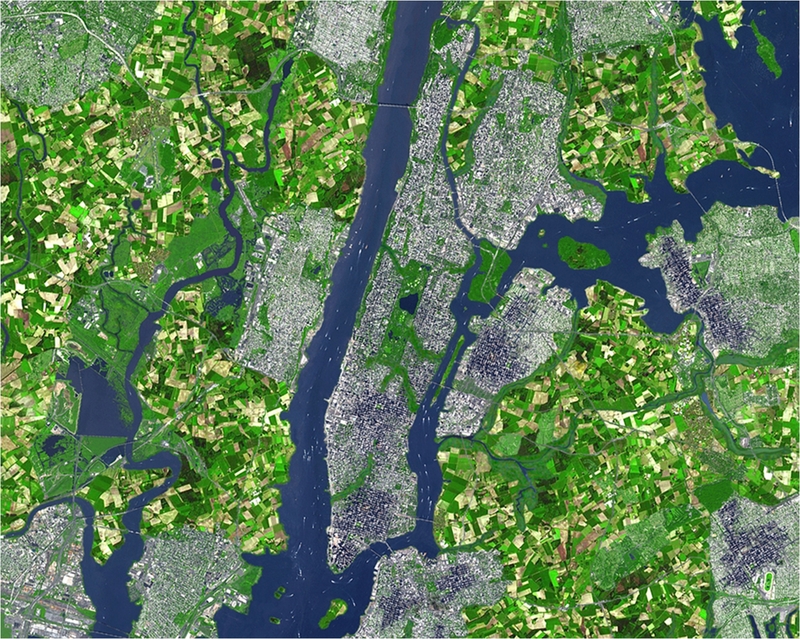 He accompanied this statistic with a satellite picture of the city, digitally edited to show much of the outer boroughs’ area covered in a patchwork of fields. In the denser areas, he imagines building green roofs, eliminating cars and integrating renewable energy into buildings. A digitally constructed image showed the Flatiron building with trees on its roof, surrounded by buildings topped with wind turbines, as bicyclists, streetcars and a small stream passed by. In the beginning, Sanderson did his work on the Mannahatta project largely using his own time and money. Eventually, the Wildlife Conservation Society allowed him to split his work time between campaigning to save endangered animals and working on Mannahatta. The state of New York began to fund his educational initiatives, but the project was considered too unorthodox and ambitious for scientific funding. Now Sanderson is funded by numerous individuals, the state and city governments, and environmental and research organizations. Sanderson is willing to put in all of this effort and time because he remembers how he felt when he first came to New York. “It’s a place you come when you don’t care about nature,” he said. As a newly minted PhD student hired by the Wildlife Conservation Society to protect exotic animals, Sanderson simply saw the city as a stopping place between flights to richer landscapes. But seeing the city as part of an ecosystem is increasingly important as the world urbanizes, Sanderson explained. “Cities are becoming the most important habitat for humans,” he said. Unless we understand how our cities connect to our food, water, and energy supply, cities will not last. If we can see that the city was radically different 400 years ago, perhaps we can envision a new city with an equally radical change, Sanderson explained. And if we can understand the importance of seeing the connections between things, perhaps we can build a city that is better connected to the world around us. Correction: A previous version of this article incorrectly stated the year in which Henry Hudson came upon his eponymous river. It was 1609, not 1409. You are right, Hudson arrived in 1609. Sorry that got through, and thanks for pointing it out!